You do know it’s based on a real-life story, right? yes, I think I remember that. I like it for every time someone says “yeah, but in real life you would never give up your cushy overseas life to return to a village”, you can point to this real story. The big difference I can see between the “real” story and the film story is that they had no connection to the village. That is, Shahrukh was looking for his nanny who lived there and fell in love with a teacher who was already running the school. He was tied to the village by more than just geography, if that makes sense? Geetha was so wonderfully put together. A woman who had a rich full life without marriage, but also wasn’t looking to avoid falling in love. The first time I watched this movie, I had such a hard time with the way their romance just kind of ended. He didn’t make a passionate speech asking her to come with him, she didn’t beg him to stay, and she also didn’t leap into his truck. I thought it meant they weren’t really in love. But now that is my favorite part of the film. They knew the other one, and knew themselves, too well to play that game. If he wanted to stay, he could stay. If she wanted to go, she could go. But they wouldn’t ask the other one to make that decision just for love. Also, Shahrukh in engineer-wear talking about education for all-HOT. The Dhoti scene 🙂 She was so mature and grown up about it, and loved a shy SRK. Sigh Gayatri joshi was such a good partner to him in this. And I loved the way they fight about the aunt. She’s not related by blood to either of them but they’re both so protective/possessive of her. I loved the way they fought in general!!!! It was unique, not that they were fighting because they were passionately in love, but that they were both passionate about similar things and that is why they fell in love. When Gayatri rejected the suitor who wanted her to quit working, he didn’t even fight back, and neither did his parents. They had no opinions on this issue really, not until she brought it up. But Shahrukh would have opinions because it is something he would care about. The same way Gayatri could have just let Shahrukh take the aunt away with him, but she cared too much for that, and he cared to much to just leave her there. Their arguments could flare up and die down without hurt feelings, because it wasn’t personal, it was just that they both cared intensely about the same things. And cared enough to be willing to think about and listen to the other and change their minds eventually, like Shahrukh deciding to leave the aunt where she was happy, or Gayatri accepting his help with her school. And the “Rivers of India” scene! ❤ that scene! I need to re-watch it! 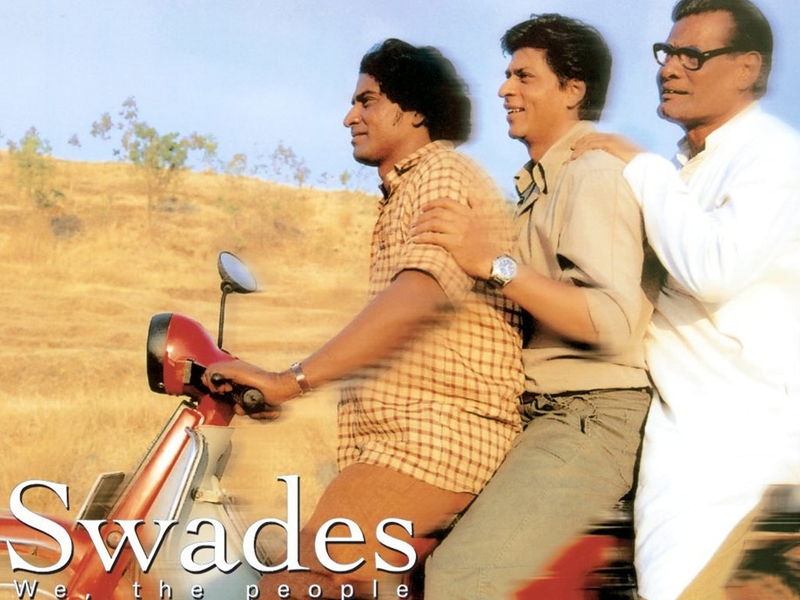 Swades was one of the first movies I saw when I first started watching Hindi movies. I thought it was okay but also kinda boring at the time. I feel like this is one of those movies I need to rewatch. It’s a movie you have to kind of age into. I didn’t like it much when I first saw it, but every time I go back and watch it again, I find something new and like it more. I am actually watching it tomorrow with two newbies. They are both environmentalists and political activists, and also neopagans. He has an interest in world religions. Plus, I just saw A.R. Rahman’s live show last night, so I get to hear his glorious soundtrack. Win, win, win. By the way, I miss being able to discuss a movie I just saw, mainly because I have not been to many movies in theaters lately. Maybe you can “assign” a streaming movie and give us a week’s notice so we can watch it separately and then come here to discuss? That actually sounds kinda fun! Oh, I like that idea! I like it when people can discuss a film, so I try to review films you’ve been talking about or I can assume most people have seen. But if there was some way to ensure everyone had just watched it, that would be even better. Hmmm. I will think on this. Swades is one of those movies I watched in a huge but very ordinary cinema hall, which meant cheap tickets and a varied audience (we were students so we love cheap ticket rates in theatres). I felt a general impatience towards the movie from half the crowd. While the other half, like me, was completely drawn in. There’s something about this movie that just makes my heart hurt in good ways and bad. It touches on certain very pertinent issues without going into the depth of it, which is fine because it chooses to acknowledge other relevant issues. But one thing I loved was the scene where Shahrukh talks about cultures. There is no one culture Is better than the other, it’s all different cultures and there’s good and bad in it all. It may not sound like a radical concept now, but at the time it was. It made me think. It still makes me think. There’s something about a movie that moves you and makes you think. Music music music. Sigh. I still can’t hear ye jo des hai mera without tearing up. Also the desire just go back home becomes the overwhelming sentiment. Also yes I love Geeta. I loved the way they loved. I loved everything about her. She didn’t have to leave her life behind and go. He understood it. The desi friend casually says just ask her to come here. But Mohan wouldn’t really force her because he knows her. It’s beautiful. I forgot about that moment! He doesn’t even really give an answer to his friend, just doesn’t really respond. They had such a perfect understanding, he knew she could never be happy somewhere else and the village needed her. And she knew that if she wanted to go with him, she could, the offer was there without needing to be spoken. To actually have the conversation would be something a couple who didn’t know each other as well would do. There was no need to say the words aloud “I love you and I want you to come with me” and “I love you but I can’t leave here”. I’ve given my prior comments some thought and would like to revise them here. I said Raju Hirani should study Swades as a template for how to craft a social message film. But now I think Raju Hirani movies show lots of proof that they’ve watched and rewatched Swades as their template, esp 3 Idiots is proof of that. What is so parallel is the Odyssey-style storytelling – “show” us the hero’s journey, while adding in short vignettes from side characters he encounters along his journey, “telling” us their plights. The hero’s journey convey the social message, but the side vinlgnettes tell the audience in very clear expository style “why” the social message matters. Swades is still better than any Hirani movie, and they still have a lot to learn from this gem, but I’m going to redirect my criticism now to another auteur. Imtiaz Ali should study Swades as a template for how to present a self-actualization story in a clear-eyed well-paced way. While Gayatri wasn’t the lead, we were still given enough of her backstory and motivations to understand her POV and her love for SRK. Imagine if Deepika were fleshed out just a little bit more ala Gayatri, how much richer Tamasha would have been? Or if the second half of Tamasha was more clear eyed and committed to which self actualization story it really wanted to tell, instead if telling several half-heartedly. JHMS was definitely an improvement in both ways, I feel like Imtiaz might have watched both Swades and Before Sunrise to improve upon Tamasha in his storytelling, world-building, and intimacy. A lot of people I know watched swades in the theaters when it came out and thought it was slow and boring. But wasn’t it the first among the 21st century phase of modern-day social message movies from Bollywood? I’m thinking that after a decade of seeing subsequent social message movies like 3idiots, TZP, PK, Secret Superstar, and all the other films by Hirani or Aamir Khan, to then cycle back around to Swades now makes swades not only not slow and boring, but almost revolutionary in its simplicity and eminently watchable. Every second of this movie matters to the story. My favorite scene is when gayatri, as a stand in for the audience, asks “are you an astronaut?”, to which he replies that he’s just a project manager on a global precipitation management project. And Gayatri response mirrors the audiences. As in, yeah if you are an astronaut, maybe you need to stay in the usa, but if you are just a project manager, then why aren’t you here again? Plus with rain being so important especially in villages, maybe India could use his expertise. The music and especially the score is just so chill yet so evocative. The end credits score just does not leave you, long after you turn off the tv. I wish more mainstream movies utilized serene music like this. Finally I think it’s revolutionary, both a decade ago and even today, to not tell us how the love story “ends”. We get a wrestling match, and comfortable interaction with the love interest, but no wedding scenes, no flashbacks to key wedding moments or moving into a home together, not even a quick pan to a wedding ring on her finger or mungalsutra on her neck. Maybe he’s living in delhi working for the NASA equivalent that he earlier mentioned and just visiting the village, maybe they are married but living in two different places, maybe he brought internet to the village and now telecommutes… Who knows? I can’t think of another mainstream Bollywood movie that doesn’t “resolve” the love story. Thank you for your comments! Lots to think about. You are right, this is a perfectly constructed internal film. Similar to but more successful than JHMS. A lot of the criticism of JHMS seemed to be “nothing happened” or “what was the point”. And of course the point wasn’t what “happened”, a search for a ring or a chase through the streets or any of that, it was how it changed the characters. Swades is really the same, Shahrukh brings electricity to the village, helps keep the school going, sings a song when the projector breaks at film night. But none of that really matters, what matters is what happens to him on the inside, the slow realignment back to home. Only there is a perfect balance of making it FEEL like these things matter. They are interesting, they are challenges we care about, they have a goal and a resolution. They are a pleasing way to pass the time while we wait for the real narrative of the film, the internal one, to play out. As for weak heroines, even Ashutosh himself has fallen pray to that. Mohenjo Daro really irritated me, because there was this big build of her being the one to “save the city” and “make a choice”, and I was waiting for her to have a slow growth towards responsibility and understanding greater issues like Hrithik did, and then her character just sort of went flop. Versus in this film where we slowly come to understand Gayatri’s view and motivations and emotions. We are seeing her from Shahrukh’s eyes, she doesn’t necessarily get the big back story he does or anything, but she is still a 3 dimensional person. She is a teacher and loves her job and is dedicated to her school. And she also is interested in getting married, but not if it means giving up who she is. And she is the head of her household, raising her brother and taking care of her aunt. And we learn her personality, passionate about what she cares about, reserved, slow to open up to others. All of that is so much more than the usual heroine gets. And yes to the ending! It resolves the essential conflict of the narrative, Shahrukh needing to find a place to be happy and belong. He belongs now, that’s all that matters. And whether that means he and Gayatri are married, or will be married, whether he is living in the village or elsewhere, it doesn’t matter. All that matters is that he made his decision and has come home again.